Cut ginger into thin slices and green onion into large chunks. Mince garlic. 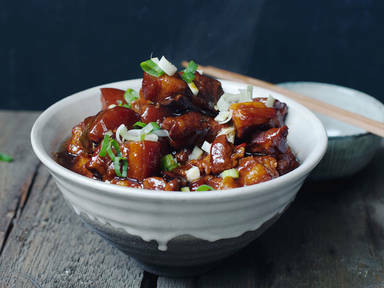 Cut pork into bite-sized cubes. Fill wok one third of the way full with hot water. Place pork belly in water, bring to a boil, and cook for approx. 5 – 7 min. Strain and set aside. Add vegetable oil and sugar to wok and cook over medium-low heat for approx. 3 – 5 min. until it begins to lightly caramelize . Carefully add a bit of water to thin out caramel. Remove caramel from wok and set aside . Heat oil over medium-high heat, return pork to pan, and cook until fat has rendered, approx. 4 – 6 min. Discard excess oil from pan and then add green onion, ginger, garlic, chilis, star anise, cinnamon, and bay leaves. Return caramelized sugar to pan and cook for approx. 1 – 2 min. until all ingredients are evenly coated in sugar. Next, add soy sauce, wine, tofu, and water. Reduce heat to low and cook for approx. 1 – 2 hrs. until volume has reduced by half and sauce has thickened. In a small bowl, mix equal parts corn starch and water and stir in the sauce. Enjoy with aromatic rice!